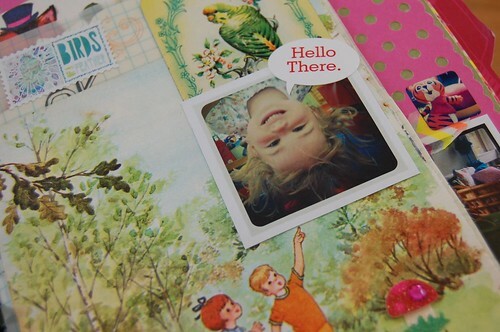 This week I thought I would take you on a guided tour of my latest passion Smashbooks / Scrapbooks / Collaging. To tell you the truth, I’m not sure what the lingo is. What I do know is that I like it. I feel like my years of hoarding kitschy ephemera and taking too many pictures is finally paying off. Everyday this week I’m gonna show you a different part of my books. Today I’m focusing on typography. See the neon letter stickers from Heidi Swapp above? That’s what I’m talking about. I love cute fonts, but alas I am not blessed with good penmanship. This being the case I am thankful for stickers, journaling cards and what not. 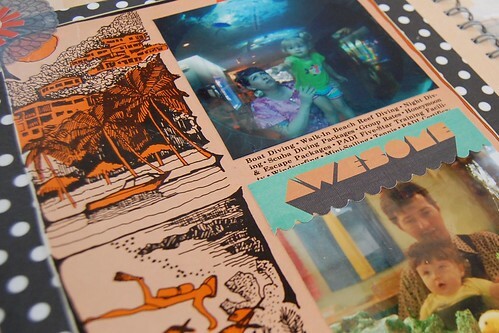 I loved this scalloped edge ‘awesome’ from Basic Grey in their Knee Highs & Bow Ties Snippet Book. 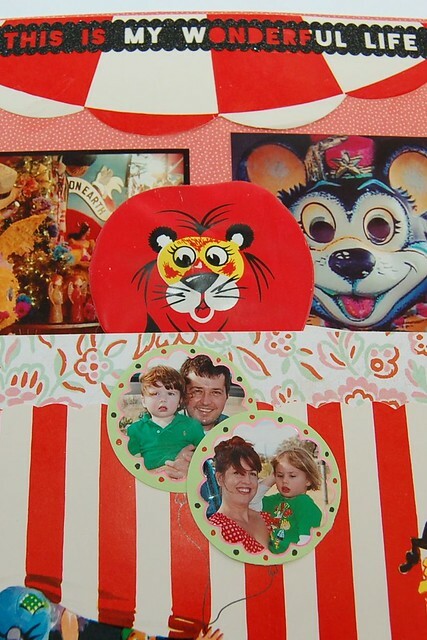 After putting together some circus themed collage curio packs for my Etsy store I couldn’t resist making a carnival-rific layout for myself. I’ve been looking for the right page to use some of these cut-out banners from Hampton Arts by Kimberly Sabel. Sometimes it’s ok to mix fonts, stickers and brands to get your message across. At least in my Smashbook it is. Fun typography can come from unexpected places like cake decorations. 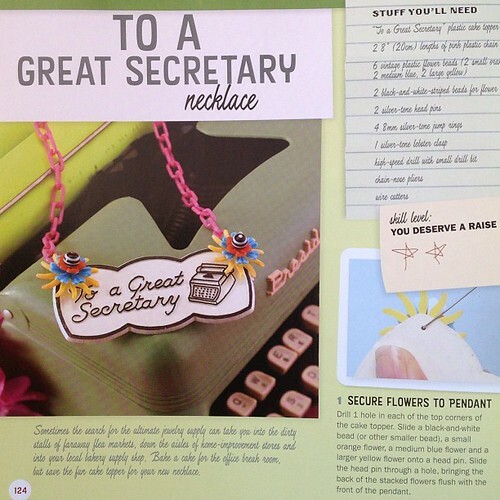 I had several of these “To a Great Secretary” pendants left over from a project in my book The Naughty Secretary Club: The Working Girls Guide to Jewelry. It’s not like I have never been exposed to scrapbooks, they have been popular for a long time. However, there was something about the Smashbook line that really spoke to me. 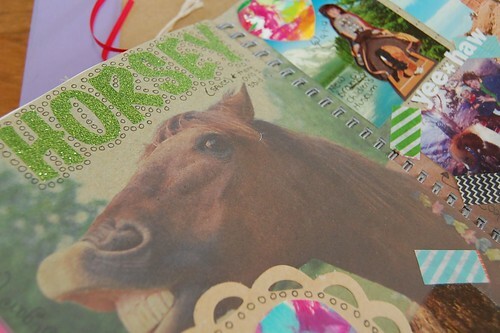 The books come pre-decorated with fun images (like horses) and great typography. Sometimes it hurts to cover it up with my own pictures. You can also decorate sticker typogrpahy for a little extra sum-something. I need some doodle coaching I think. 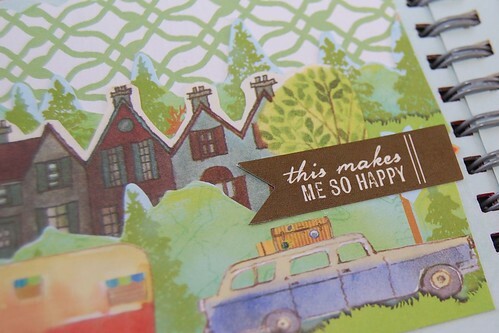 I love all the journaling cards for Project Life. I use them all the time. 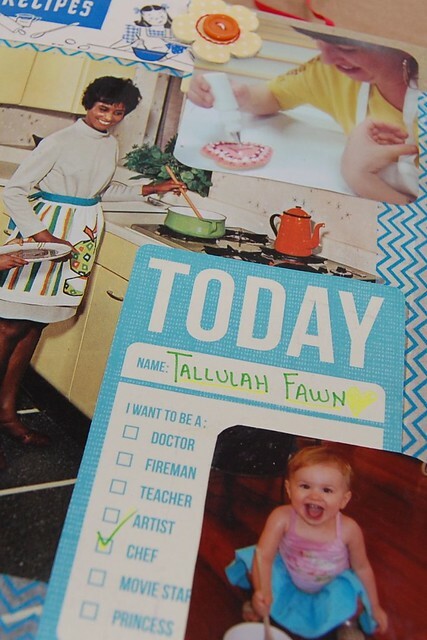 I wish there was a Smashbook / Project Life combo book. Sometimes I want those little plastic envelope pages mixed in. I love me some Thickers. I love them even more when I find them super cheap at Marshalls. Sometimes I cover up typography I’m not in love with. There was another little sign underneath this one, but I liked this one from Dear Lizzy better. I love these little picture frame thingies with words on them from Hampton Arts by Kimberly Sabel. They make even blurry pictures look better. 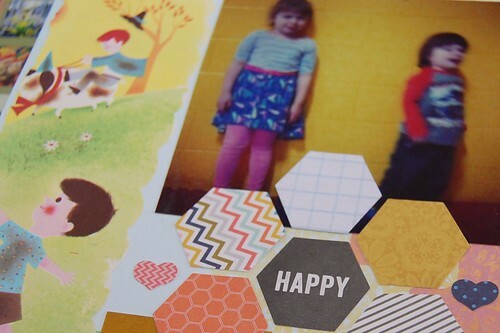 Hexagons like these from Hampton Arts by Kimberly Sabel make me happy. 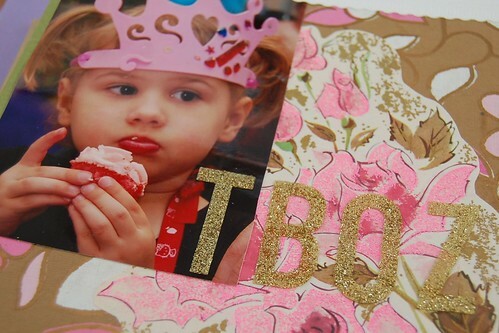 It seems only fitting that a nickname like T-Boz be spelled out in glittery gold letters. I leave you with the first page of one my Smashbooks. A small little greeting by an upside down Tallulah welcoming people in. How do you use typeography in your projects? 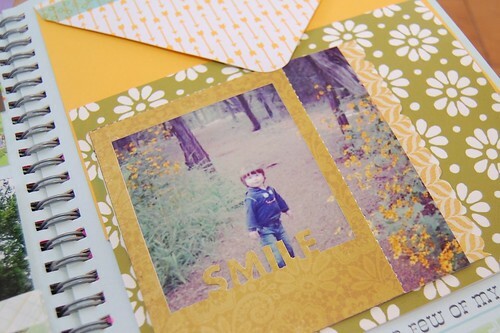 Do you write it yourself, use stickers, print it up and glue it in? I’m new to this whole thing so any tips, tricks or suggestions are welcome! See you back here tomorrow with more pictures. Posted March 18, 2013 & filed under Crafts, Paper Crafts. 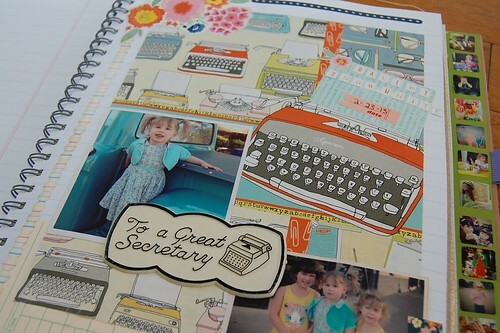 This makes me want to start scrapbooking again. Your pages look great, so creative. 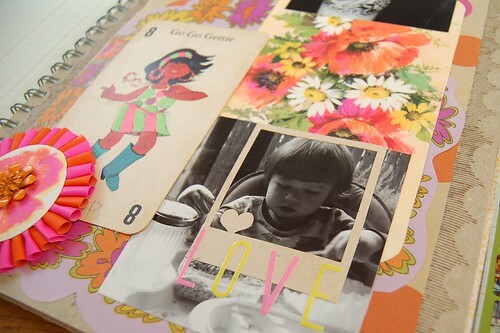 It's true, collaging helps to put some of our clutter to good use! It feels good to make art out of stuff that otherwise sits in a box or folder with other stuff. Your smash books look great! I used to be afraid of writing in my art journals (fear of wrecking page), but pushed myself and am happy to see MY own style coming through. That being said I like to use stickers, printed text AND my Dymo label maker too. Having fun and expressing myself are my only rules in my art journals.